Historically speaking, Russia had signed the Treaty of Paris back in 1856, acknowledging defeat in the Crimean War. But the claim did not last long. Russia’s leaders would go back to Crimea again and again. In 2014, Russia annexed Crimea in an illegal move that transgressed the territorial integrity of the former Soviet republic. It sparked a war that has removed nearly 2 million people and demolished the country’s infrastructure. Russia’s leaders often seem desperate and uninformed when they try to justify their doing on this matter. Vladimir Putin justifies the attack, in part, by declaring that Crimea is mostly comprised of Russian people. But for all the talk about coalition and cooperation, recent investigations suggest that it was business than goodwill. It was done to quiet the Ukrainian leadership and emphasize his position in the power struggle that arouses after Stalin’s death. Some argue that Putin’s attack of Crimea is an attempt to return Russia to the victory of its pre-Soviet days, as one of the world’s strongest civilizations. You may also want to read 8 Most Successful People in Russian Civilization. There are a lot of myths surrounding the annexation of Crimea but here are 6 popular myths about Crimea that most frequently told by Russian. Keep on reading! The U.S. annexation of Texas was a clear example of manifest destiny and promoting the interests of the powerful class. It sparked the Mexican-American war which the U.S. won, rewarding it the ownership of a huge plot of western territories. Similarly, Hawaii was annexed after the U.S. planned a coup overthrowing the Hawaiian monarchy. However, it is strange that Russia is recalling the 19th century U.S. imperialist model of extension to justify its attack of Crimea because Russia is no longer living in the 19th century. Clearly, after World War II world order and based on the United Nations’ system of international law, the crude 19th century and 20th-century land grabs have always been opposed. Russia acknowledged Crimea as a part of Ukraine in the 1994 Budapest Memorandum signed by President Boris Yeltsin. However, some people say Yeltsin was a weak president who cannot stand for Russia’s interests and therefore signed the treaty. They then argue that the Budapest agreement can be ruled out. A notable plank in the agreement required Ukraine to give away its nuclear weapons on the condition that Russia would regard and not invade its territorial integrity. Ukraine had given up its nuclear weapons years ago and Russia still made an attempt to invade. Had Ukraine not given away its nuclear weapons, it is unlikely that Russia would have attacked Crimea. The attack not only throws the entire post-World War II framework sideways. It also violates the 1968 Nuclear Non-Proliferation Treaty that encourages all countries to strive toward nuclear non-proliferation and disarmament. You may also want to read 6 Hidden Facts of Chernobyl That You Might Not Know. Ukraine has categorically gone against what the Kremlin calls ‘Crimea’s union with Russia’ and addresses the annexation as an illegal move, as do a lot of other countries. Russia’s leaders try to justify their doing by comparing it with the 1982 Falklands War between Britain and Argentina. But it cannot be used to justify Crimea’s annexation because Britain did not annex anything. Contra wise, Crimea has been internationally acknowledged as a part of Ukrainian territories since the downfall of Soviet Union, so Russia’s invasion can be classified as the military attack and a clear offense of Ukraine’s sovereignty. There was no evidence that Russian-speaking people in Crimea were threatened by Ukrainian fascists and ultranationalists, so the justification of securing Russian-speaking people in Crimea is odd at its core. There is a widely accepted international foundation of a country’s right and responsibility to secure its people abroad. But this foundation does not extend to those who simply speak its language. On this assumption, France would have every right to attack part of Cameroon or Senegal if French-speaker people were threatened. Would both U.S. and Britain, then, have every right defend English-speaking people? Rather than defending its people against a fictional threat from the government, Russia is proposing a frisky inter-ethnic conflict by taking Ukrainian political institutions and military facilities. There have been a lot of violent clashes between Russian and Ukrainian people since Moscow sent its armies into Crimea to hold a referendum on annexation. Vladimir Putin and the Foreign Ministry have argued many times about the approval and it served as the foundation for Putin’s 2007 Munich speech that cussed U.S. unilateralism. Yet Russia has completely thrown over this foundation in both the 2008 Russia-Georgia war and in the annexation of Crimea. Russia chose the fate of the peninsula with no regard for the complaints from Ukraine which had the total rights to the territory. Crimean people, including ethnic Russians, went along the vast majority of Ukrainians in promoting independence from Moscow after the unsuccessful coup in August 1991. The independence from Russia is still highly honored by most Ukrainian citizens, including those in Crimea and other regions of the country. There was never any separatist movement in Ukraine until Russia proposed the issue of attacking Crimea after Yanukovych was driven away. 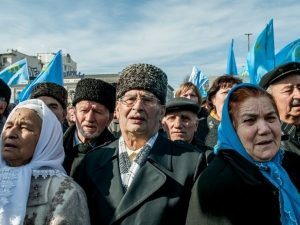 The majority of Crimean people, especially ethnic Ukrainians and Crimean Tatars, who make up 40 percent of the population do not want to be a follower of Moscow again. This is why so many Crimean people, including ethnic Russians, supported Yanukovych’s program. Yanukovych’s program was to draw together with the European Union rather than with Russia. However, the program was abandoned. So, those are 6 most popular myths about Crimea that most frequently told by Russian. Hopefully, you will find some beneficial information and new knowledge from this article.